I know I just posted the Italian Tofuballs a few weeks ago, but I figured out how to add a few more cups a vegetables to the mix while keeping the flavor and texture. I just had to share. This version calls for an egg, which helps the texture a bit, and helps them hold together. If vegan you can omit the egg altogether or substitute with a few tablespoons of aquafaba. These are a delightful snack, I actually even like them cold, or can be used to go with pasta. My toddler gobbled these up. Add oil, zucchini, onion, spinach, and mushrooms and cook 5-8 minutes or until most of the water has been released and cooked off. Mash tofu in a large bowl with your hands or a potato masher. Add Italian seasoning, salt, garlic, egg, cooked vegetables, and nutritional yeast and stir together. Add bread crumbs a few tablespoons at a time stirring to combine. The mixture should start to stick together. Taste the mixture and adjust seasonings to taste. Heat about a 1/4″ of oil in a large heavy bottomed skillet to about 350 degrees. I never actually check this with a thermometer, but you should. It should be hot, but not smoking, and when you flick a few drops of water into the oil it should sizzle and pop. Form the tofu mixture into walnut sized balls with your hands. Pack them a bit, but don’t worry if they feel loose as long as they hold their shape in your hand. If they don’t add more breadcrumbs until they do. Carefully place the tofu balls in the hot oil, and cook until one side is golden brown (3-4 minutes), flip them and cook on the other side another 3 minutes or so until golden brown. Unless you have a super huge skillet you will need to work in batches. You might need to add more oil between batches. If this happens don’t forget to reheat the oil before frying. Once cooked remove the tofu balls and place on a plate lined with paper towel to drain. 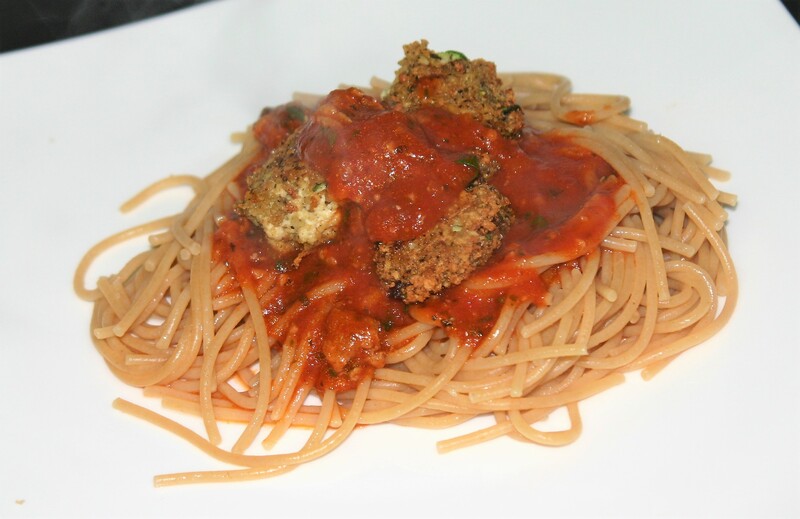 Serve hot with pasta and sauce, or just eat as is. Super yummy snack! You could also bake these on an oiled baking sheet at 375 for about 20 minutes. Still good, but not quite the same. In need of some comfort food? I feel I am most of the time in the winter. I just want warm, filling, soul satisfying food. 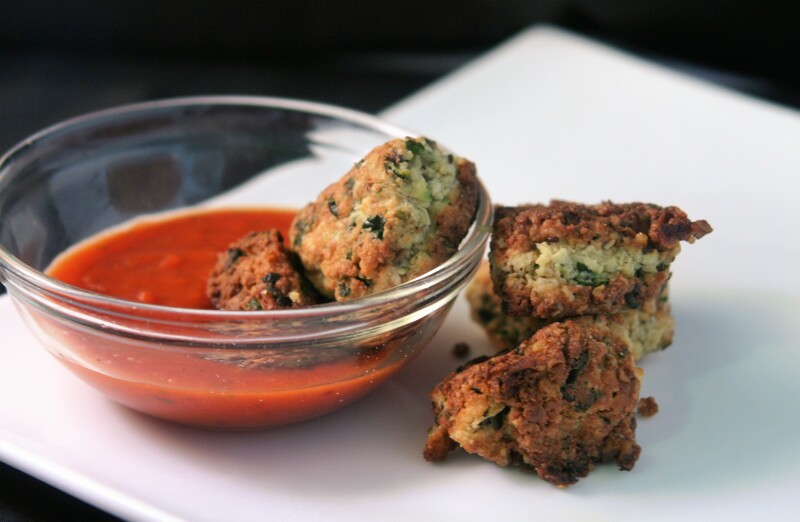 These delightful little nuggets fit the bill perfectly, especially when paired with whole wheat pasta and either your favorite sauce, or my favorite sauce. Wolfie loved to help with these. She does everything from mashing the tofu to help form the balls. She also ate them! I mean, why wouldn’t you? They are a bit crisp on the outside, a bit salty, faintly “cheesy”, and heavy with Italian seasonings. These also freeze well if you feel like making a double batch. Mash tofu in a large bowl with your hands of a potato masher. Add Italian seasoning, salt, garlic, zucchini, pepper, red pepper, and nutritional yeast and stir together. Carefully place the tofu balls in the hot oil, and cook until one side is golden brown (3-4minutes), flip them and cook on the other side another 3 minutes or so until golden brown. Serve hot with pasta and sauce.